Enjoy the momo dinner alone or with a friend ($20) and a movie (free)! Please pick up between 4:30 and 6:30pm. Enjoy 16 vegetarian momos - alone or with a friend - and stay for the free movie. Pick up between 4:30 and 6:30pm. Enjoy a momo dinner ($10) and a free movie! Enjoy the dinner ($10) and the movie (free)! Please pick up 4:30 - 6:30pm! Wonderful Momo Dinner ($10) plus a movie (free)! Enjoy the dinner - alone or with a friend ($20) - and stay for the movie! Please pick up between 4:30 - 6:30pm! 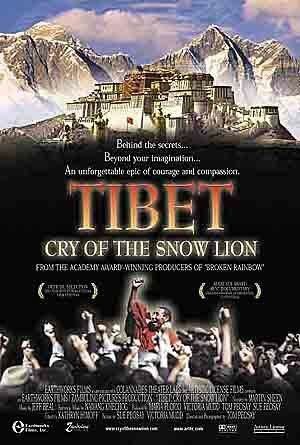 Tibet: Cry of the Snow Lion is an extraordinary documentary about the near-destruction of an enlightened 1,700 year old culture, the incredible suffering of a violated people, and the spiritual survival of hope in the hearts of those who believe that one day they will be able to re- taste the joys of freedom. Director and cinematographer Tom Peosay spent ten years on this vast and substantive project shot on "the rooftop of the world." Interviews provide both historical and contemporary perspectives on the situation in Tibet, including commentaries by His Holiness the Dalai Lama; Lhasang Tserling, founder of the Amnye Machen Institute for Higher Tibetan Studies; Robert Thurman, Director of Tibet House in New York City; John Avedon, author of In Exile from the Land of Snows; Stephen Batchelor, Buddhist scholar and author; Robert Ford, author of Wind Between the Worlds and one of the few westerners to have lived in pre-Chinese Tibet; Blake Kerr, author of Sky Burial: An Eyewitness Account of China's Brutal Crackdown in Tibet; Drew Liu, Executive Director of the China Strategic Institute in Washington, D.C; and many others.